To Margaret Blair Ramsay, great grandmother, founder of Cheetham Hill Institute and Infants Home. From Frances White. Vivien and I, your great granddaughters, have at last walked the streets you waled in Manchester. I want to write of our pride in your indefatigable worker as founder & tireless worker for the Cheetham Hill Institute and Infants Home from 1881 & until your death in 1916. 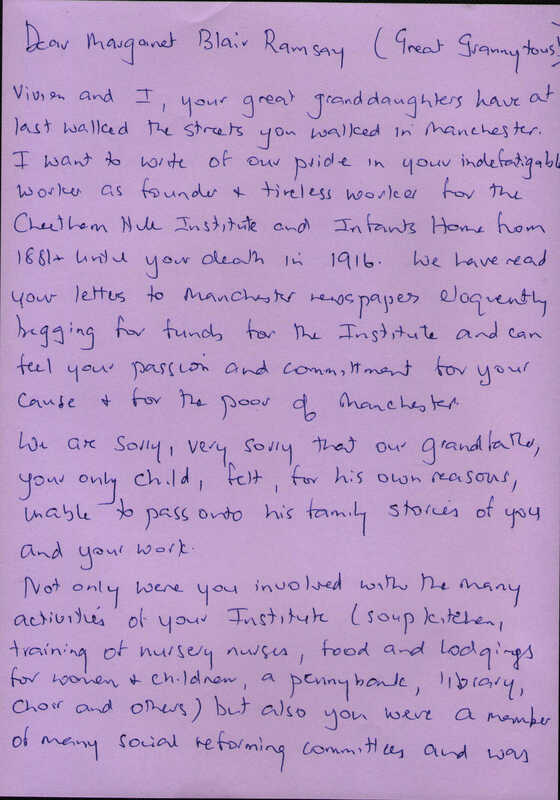 We have read your letters to Manchester newspapers eloquently begging for funds for the Institute and can feel your passion and commitment for your cause & for the poor of Manchester. We are sorry, very sorry, that our grandfather, your only child, felt, for his own reasons, unable to pass onto his family stories of you and your work. Not only were you involved with the many activities in your Institute (soup kitchen, training of nursery nurses, food and lodgings for women and children, a pennybank, library, choir and others) but also you were a member of many social reforming committees and was one of the first elected women to the Board of the Guardians of the Poor in the late 1890s and early 1900s (at a time when your son had disappeared on a boat to New Zealand) to start a new life with a new identity. Has all this work in Cheetham Hill been forgotten? I can’t find your burial place in Southern Cemetary - there is no record. 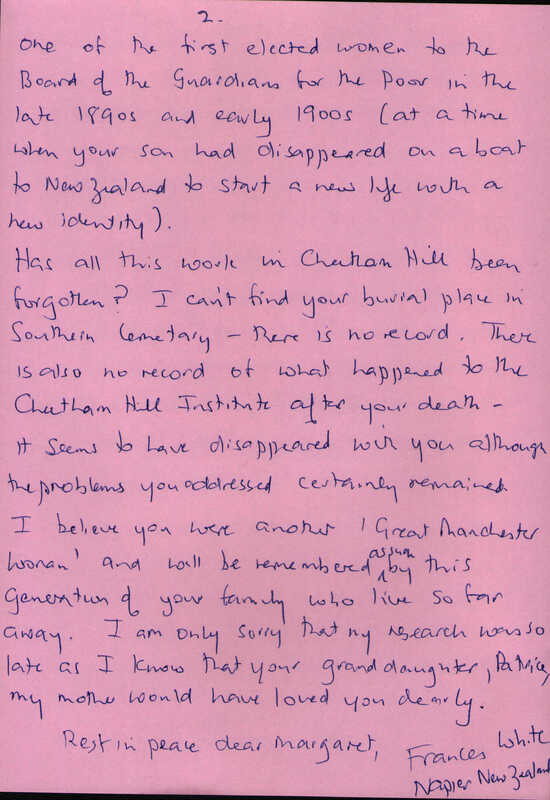 There is also no record of what happened to the Cheetham Hill Institute after your death - it seems to have disappeared with you although the problems you addressed certainly remained. I believe you were another “Great Manchester Woman” and will be remembered as such by this Generation of your family who live so far away. I am only sorry that my research was so late as I know that your granddaughter, Patrica, my mother, would have loved you dearly. great grandmother, founder of Cheetham Hill Institute and Infants Home.